There is no minimum deposit required by Internaxx. This means that it's an ideal broker if you want to trade or invest with a smaller amount. It is a good broker to start your investment journey with, as you can add more funds to your account later as you get more experienced in managing your investments. Brokers that don't require a minimum deposit do so to encourage people to try their service without requiring a large initial commitment. 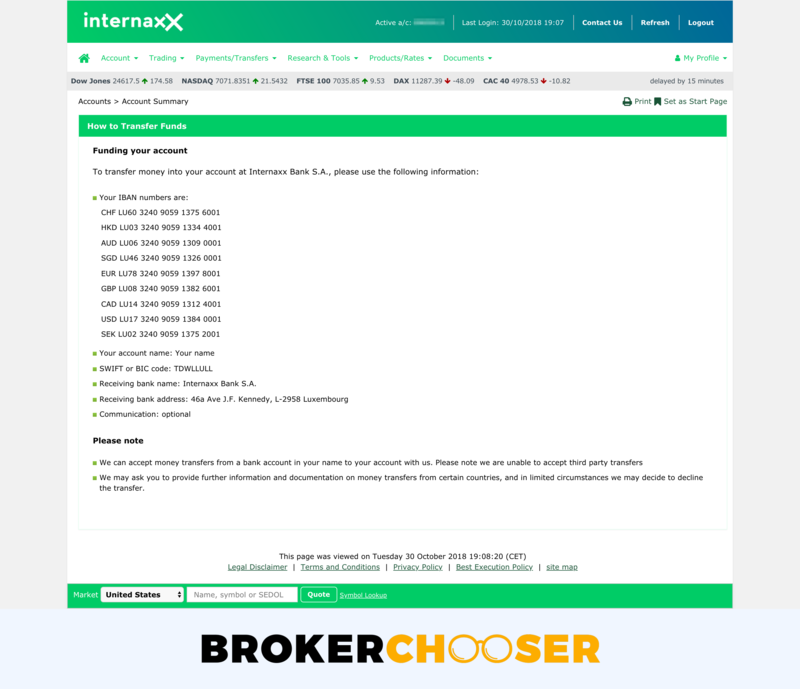 Internaxx does not charge a deposit fee. This is great because the broker won't deduct anything from your deposits and you only have to calculate with the costs charged by the bank / third-party you send the money with. If you want to know more about Internaxx fees, check out the fee chapter of our Internaxx review. A minor issue with depositing money to Internaxx is that based on our experience it's not user-friendly compared to similar brokers. This means either that the interface is not user-friendly or that figuring out where and how you have to make the transfer is a bit complicated. Each trading account has a base currency, which means that the broker will hold your deposited money in that currency. At some brokers, you can also have more trading accounts with different base currencies. For example, at IG, it is possible to have both EUR and USD-based accounts. Why does this matter? A currency conversion fee will be charged if you deposit in a different currency than the base currency of the target trading account. It's likely not a big deal but something you should be aware of. Some online brokers offer trading accounts only in the major currencies (i.e. USD, GBP, EUR and sometimes JPY) and some support a lot more than that. Internaxx supports the major currencies like USD, GBP and EUR, but does not support minor currencies. If you would deposit in a major currency anyway, then the online broker won't have to convert it. However, if you use a minor currency that is not supported, Internaxx will convert your deposits and you will be charged a currency conversion fee. A convenient way to save on the currency conversion fee if you wish to fund your brokerage account from a less common currency (or just a currency different from your existing bank account) can be to open a multi-currency digital bank account. At Revolut or Transferwise the account opening only takes a few minutes after which you can upload your existing currency into your new account, exchange it in-app at great rates, then deposit it into your brokerage account for free or cheap. At most brokers, you can open your trading account online. To open an account, you have to provide your personal details, like your date of birth or employment status, and there is also usually a test about your financial knowledge. The last step of the account opening is the verification of your identity and residency. For this verification you usually have to upload a copy of your ID card and a document that validates your proof of residence, for example, a bank statement. If you don't know which broker is suitable for you, use our broker selector tool. First you have to sign in to your already opened trading account and find the depositing interface. After this, you select one of the deposit methods the broker supports, enter the deposit amount and make the deposit. Bank transfer (sometimes called wire transfer): you have to add your bank account number in the deposit interface. The bank account has to be in your name. After this, you need to start a bank transfer from your bank. The broker will give you a reference number that you'll have to enter as a comment in your transaction. This will allow them to identify your deposit. Credit or debit cards: just as with a normal online purchase, you are required to enter the regular card details. However, unlike any other online purchase, it's required to use a card that's in your name. In some cases, like with IC Markets, you'll also need to verify your card by scanning it and sending it to the broker. This is yet another anti-money laundering measure on their end. Card payment is usually the preferred and most convenient way of depositing. On the other hand, some brokers define a cap for card deposits, so for a larger amount you might have to use the bank transfer. Online wallets like Paypal, Skrill, Neteller, etc. : it works just like any other online purchase. The interface of the wallet will pop up where you'll have to enter your credentials (username and password) and carry out your transaction. Depending on the method you chose, it might take a couple of days for your deposit to show up on your brokerage account. When it happens, the brokers usually send you an email to confirm the receipt of the deposit.